Ever wonder what it would be like to get up and go on a whim, RV and all? You may think it’s impossible, but with THIS app, you’ll find it’s easier than you ever expected! By downloading this app, you’ve just made it easy to drive your RV into the sunset at any given time. So… what’s this app for, exactly? Let’s take a look at some of the highlighted features this app provides you. 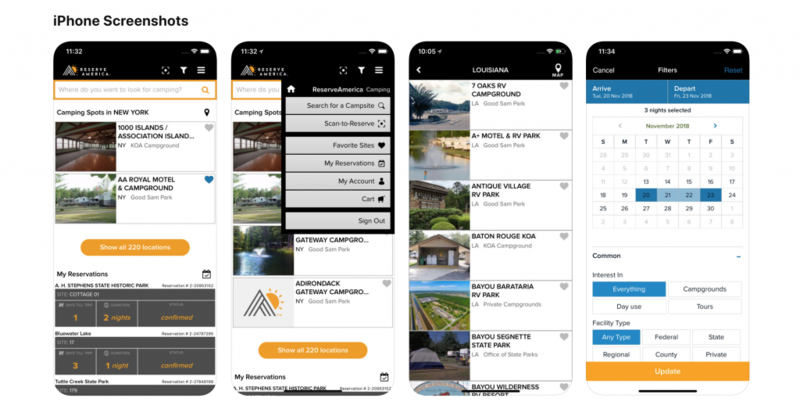 If you’ve been itching to get on the road this spring, don’t wait to get online and book a reservation, just tap this app and search the many, many options of campgrounds they have and book your next adventure in minutes. This is the easiest way to find your favorite camping destination! What’s even better is that after you’ve found it, you can “save” your favorite campgrounds. You’ll always have a list of the best destinations right there on your app. There’s also a function that allows you to see all of your booked reservations on the provided calendar. This is an easy way to keep track of all of your trips, and your friends will thank you for the fast answers to their inevitable question of when you’ll be gone this summer. It will be easy to find a place you love using the variety of search options, including a map-based search which is helpful when looking for the nearest campgrounds to certain parks. Add the dates you’ll be staying, and filter your results by site type, amenities, and more. If you haven’t purchased your desired recreational vehicle yet but are excited to use this app, check out our new RVs for sale and start your RV lifestyle off right with this amazing app! If you have any questions concerning RVs, please feel free to contact us! We wish you happier and easier camping with our camping tips!